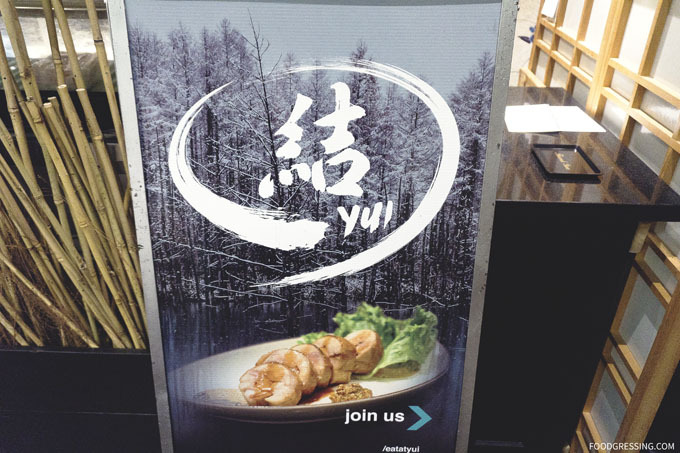 Yui Japanese Bistro, which specializes in aburi-style (flame seared) sushi at affordable prices, has just added a few new items to their menu. The restaurant opened in April and is a hidden gem of sorts as it is tucked away in an office building at 1185 W Georgia St. I recently tried the new additions to the menu at a media tasting. Here is a look at what you can expect. 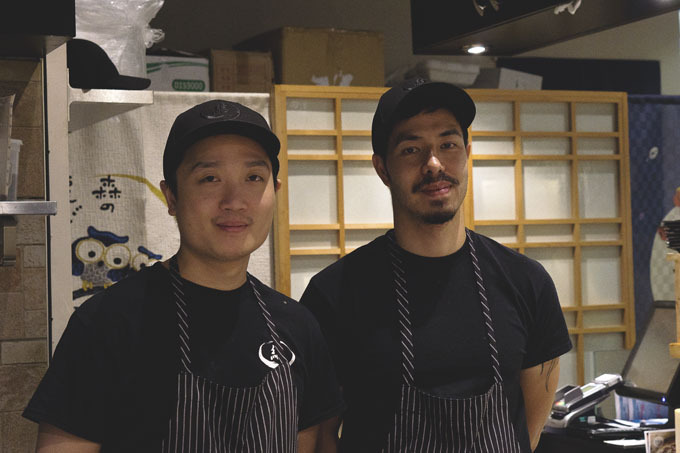 Yuio Japanese Bistro is owned and operated by Chefs Reginald Lai and Ping Ho who have both worked at prominent Japanese restaurants in Vancouver, Miku and Minami. This is their first venture on their own. 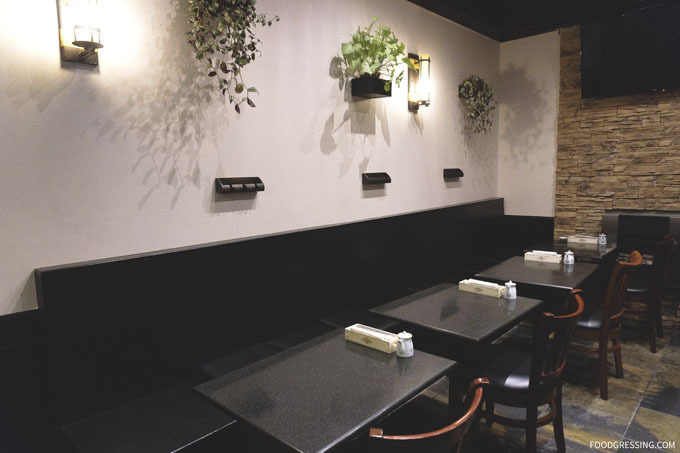 Yui Japanese Bistro occupies just a 570-square-foot in the ground level of the building. 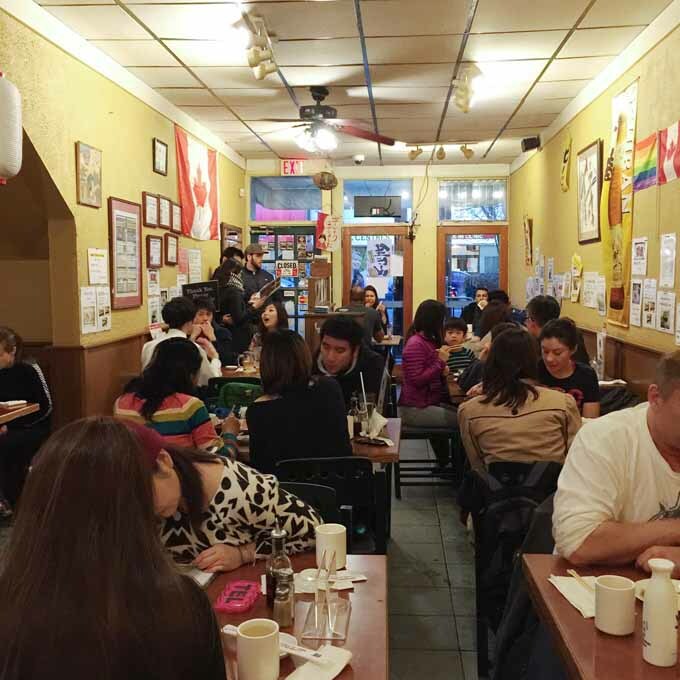 The interior has limited seating but take-out is an option. 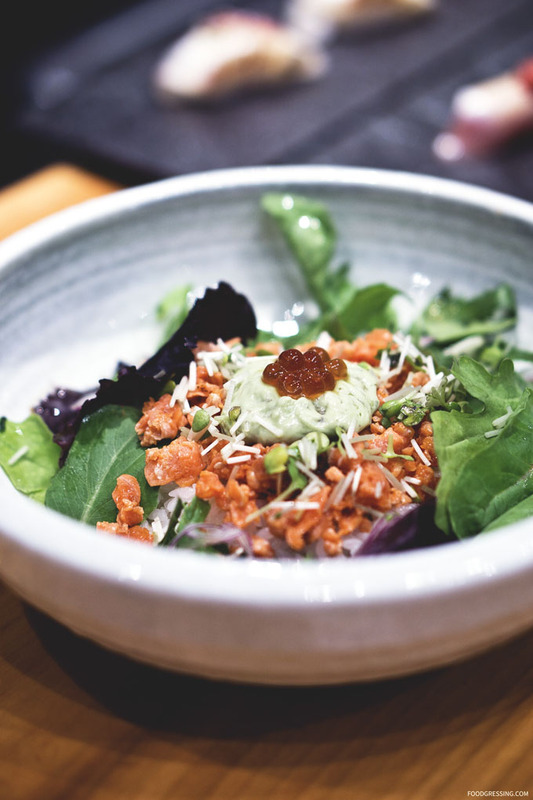 The Yui House Salad is a great palate -cleaning starter. 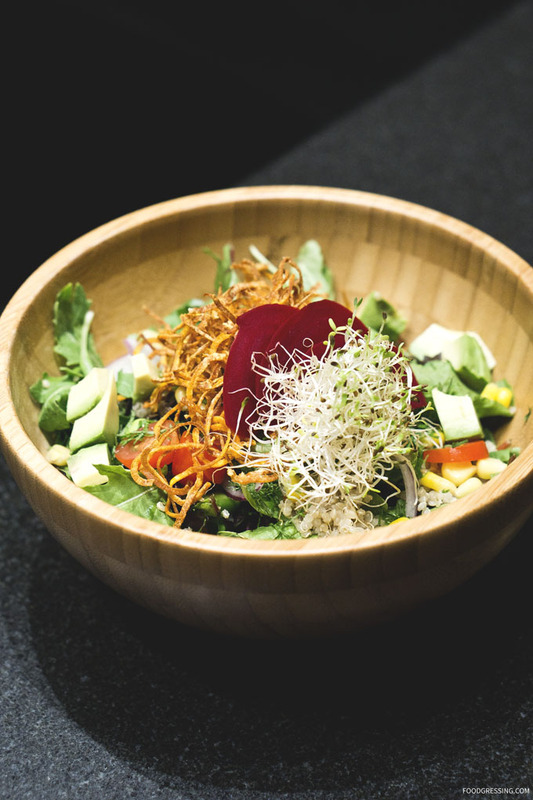 It is made with an organic green mix, edamame, quinoa, olive, sweet corn, red onion, avocado, tomato, redbeet, sweet potato chips, shiso leaf, and chef special dressing. Lots of great fresh ingredients with crisp textures. Now with all the sushi that I will be discussing, let me start by saying the rice prepared by the Chefs were on point. The temperature of ther rice was about body and you could feel each grain against your tongue. Delicous. 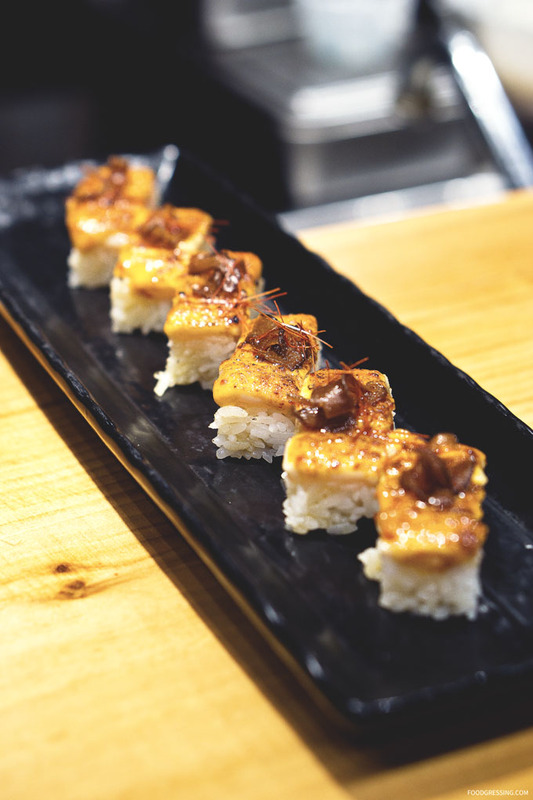 The Tai Oshi was creative and ultra-delicious. 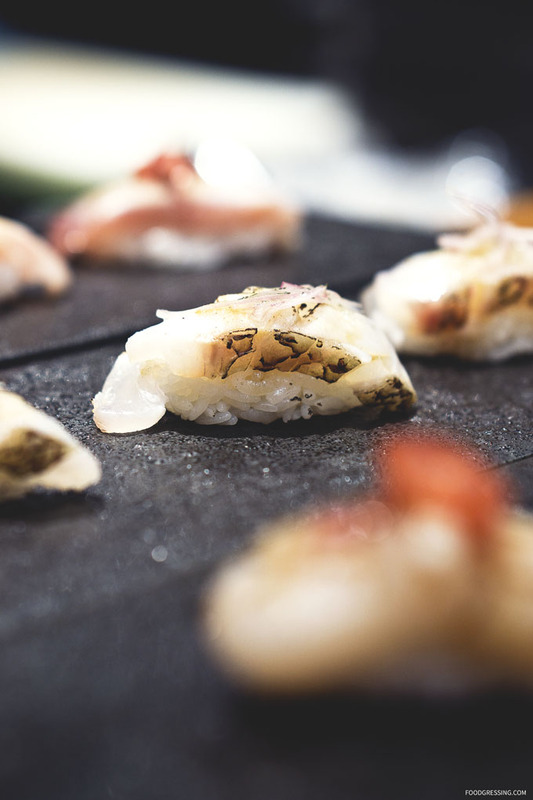 I loved the crispy shiitake topping which gave the suishi some light earthy flavours. Other toppings were sesame leaf and red pepper thread. There were also hints of spiciness from Chef’s Special Spicy Sauce. 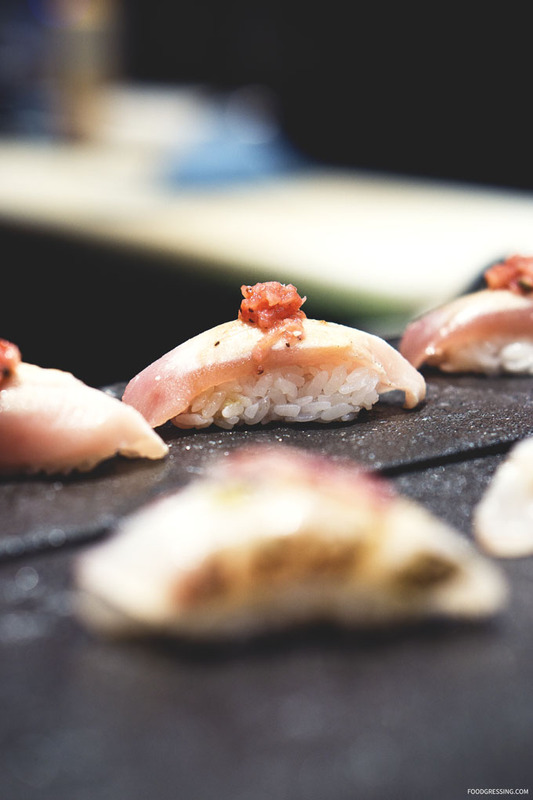 The Bincho (Albacore Tuna) Nigiri featured a slightly sweet strawberry salsa topping. It thought it was very unique and memorable with hints of sweetness. 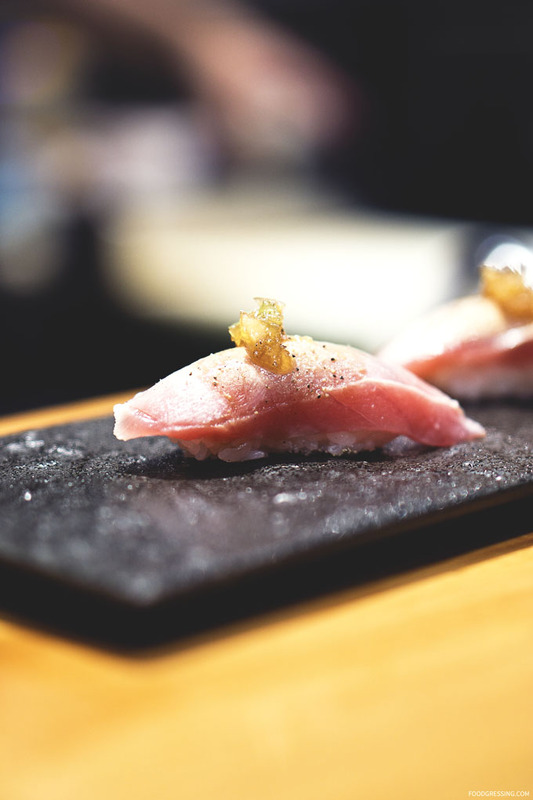 The Aburi Tuna (Blue Fin) Nigiri came wwith wasabi pickle sweet onion. The bright flavours complemented the buttery tuna. The Tai Nigiri with dill shallot sauce had more neutral flavours. We also indulged in the Hokkaido scallops with ume sauce. The slice of tomato on top added some subtle bright, tangy flavours. The Smoke Salmon Delight was wonderfully delicious with melt-in-your-mouth seared wild salmon, tuna, chop jalapeno, wasabi mayo, mango salsa, and alfalfa sprout. And that avocado sauce is just heavenly being creamy and smooth. 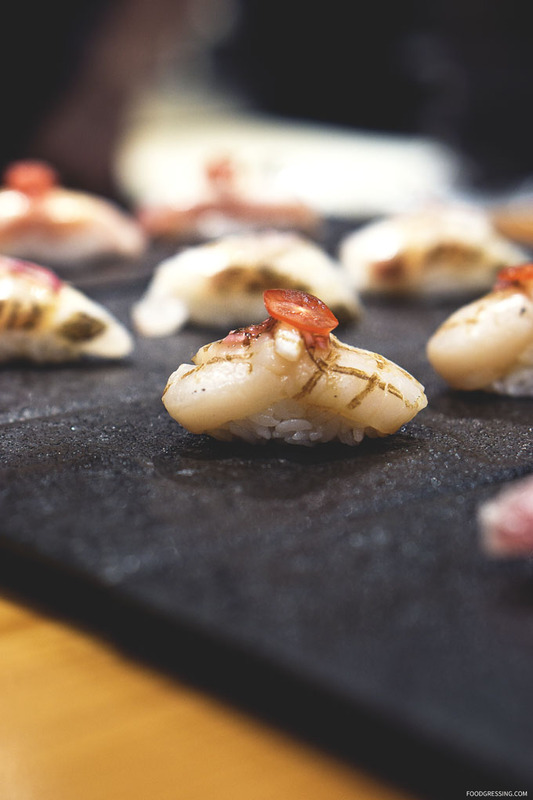 At first glance, Sushi Itoga doesn’t look like your typical sushi eatery. The interior design is more like a hipster cafe: the space is bright and there is one large communal table. 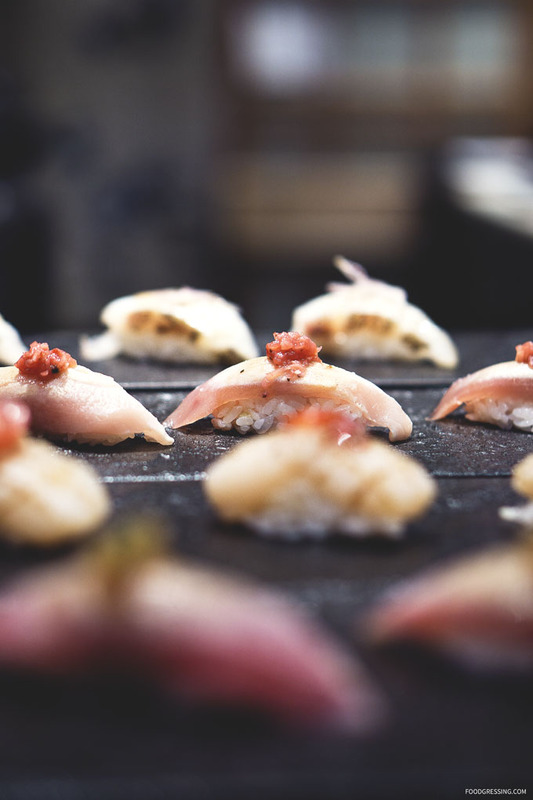 Although it seemed a bit awkward at first to enjoy sushi at a communal table, I quickly got over it. 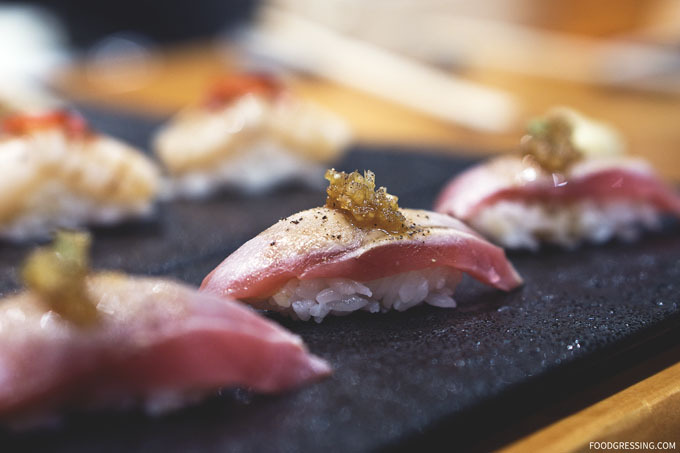 I was here for the fresh, affordable and Ocean Wise sushi. 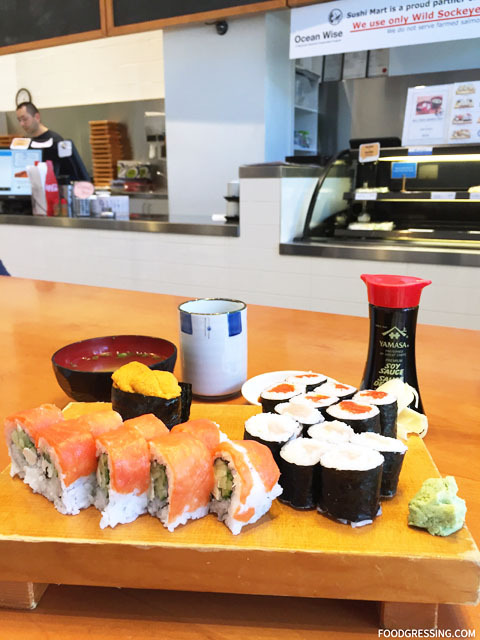 I dined at Sushi Itoga twice for lunch and here is a review of my experiences. 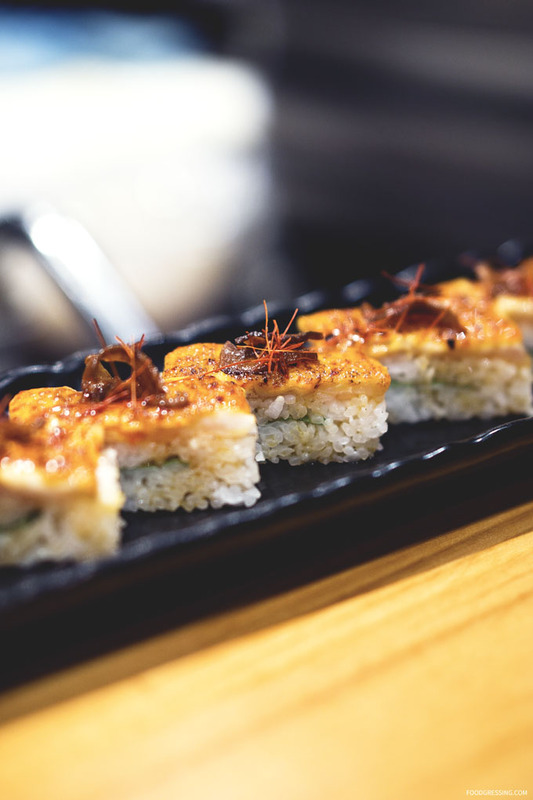 I’m a supporter of ocean-friendly seafood and was keen to try Sushi Itoga’s Ocean Wise features. In general, the sushi tasted fresh and delicious. The Alaska was particularly good because I really enjoyed added textural contrast from the sesame sauce topping on the wild salmon. While they offer the regular California roll with imitation crab, I much preferred having real crab meat in my sushi. 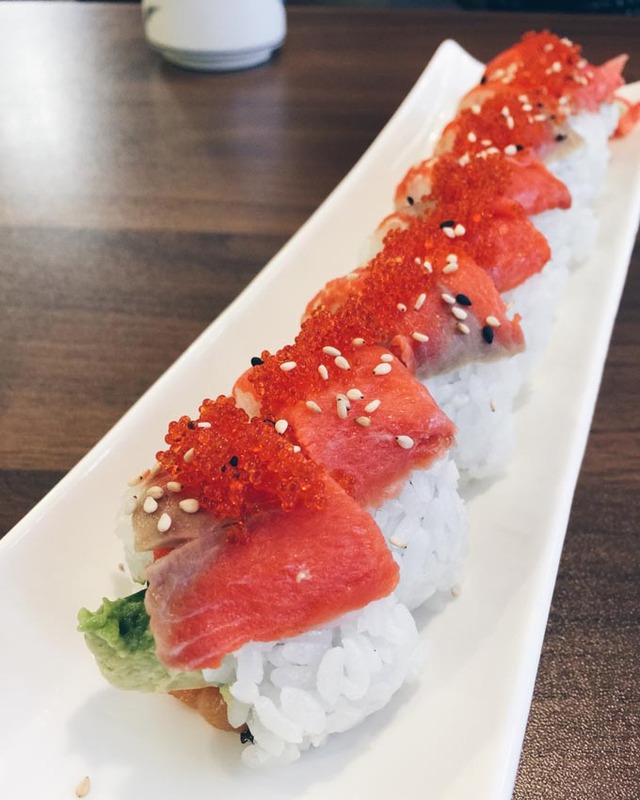 The BC and Spicy Tuna sushi were simple but tasty. 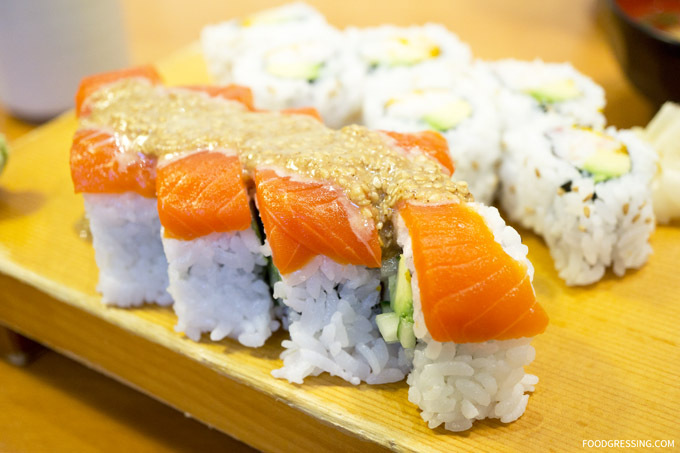 The Philadelphia was my least favourite – cream cheese with wild salmon and rice just doesn’t taste good to me. I’ll pass on this next time. 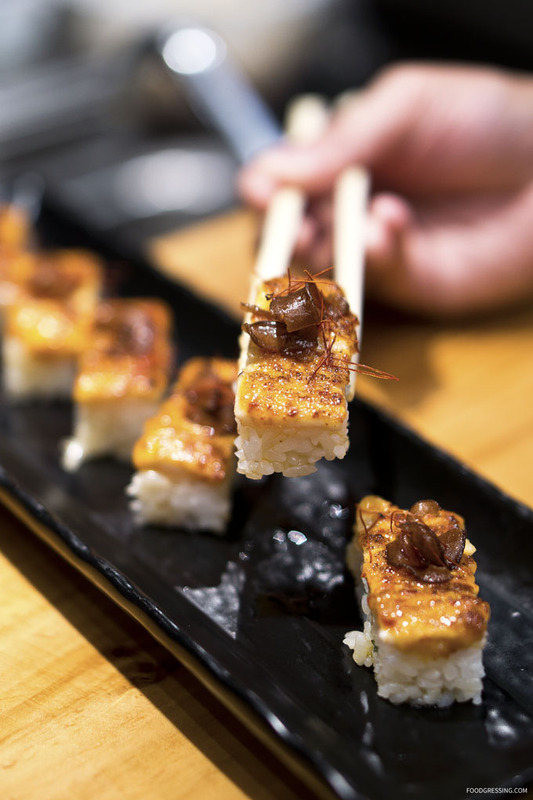 Furthermore, I don’t think I’ll order uni (sea urchin gonads) again at any sushi restaurant. 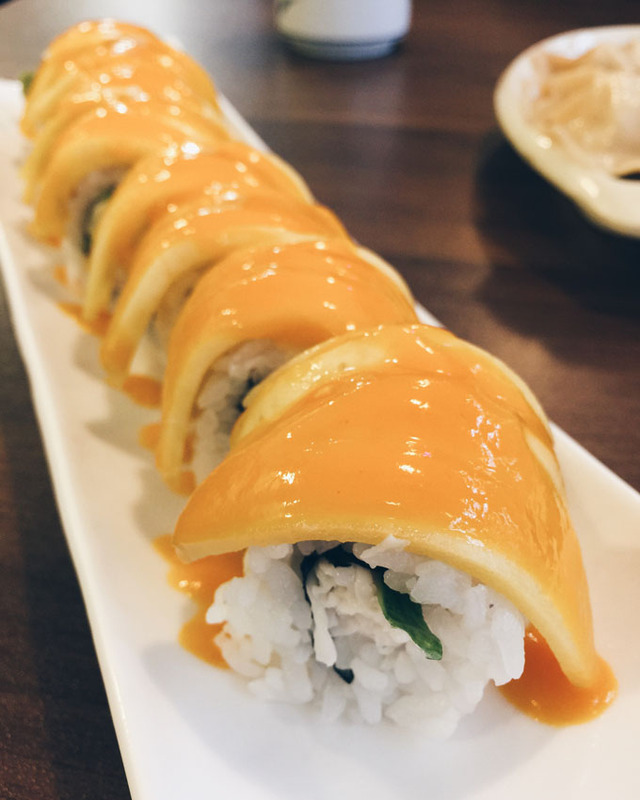 With its unique texture and taste, I think uni is a love it or hate it item. 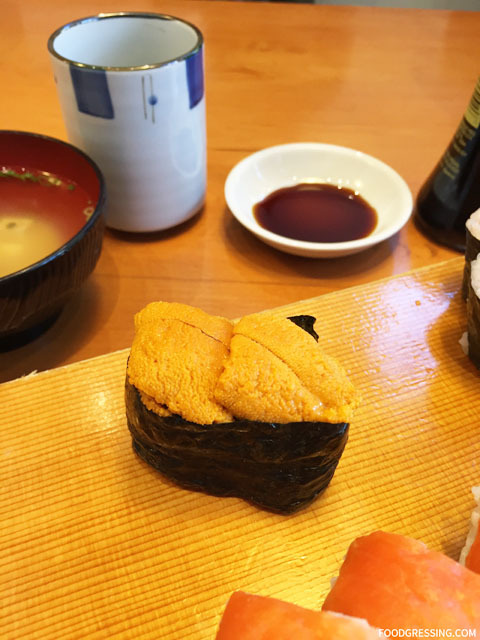 The uni at Sushi Itoga was firm, moist and retained a good shope, but it still didn’t look too appetizing appearance-wise. Perhaps it’s an acquired taste, but I just wasn’t enjoying it the smooth, wet, custard-like texture. It sure did taste like the ocean. 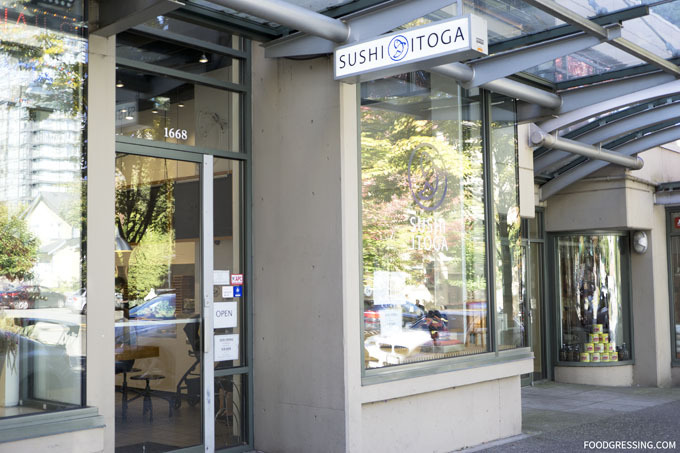 There is no shortage of sushi restaurants along Davie Street. 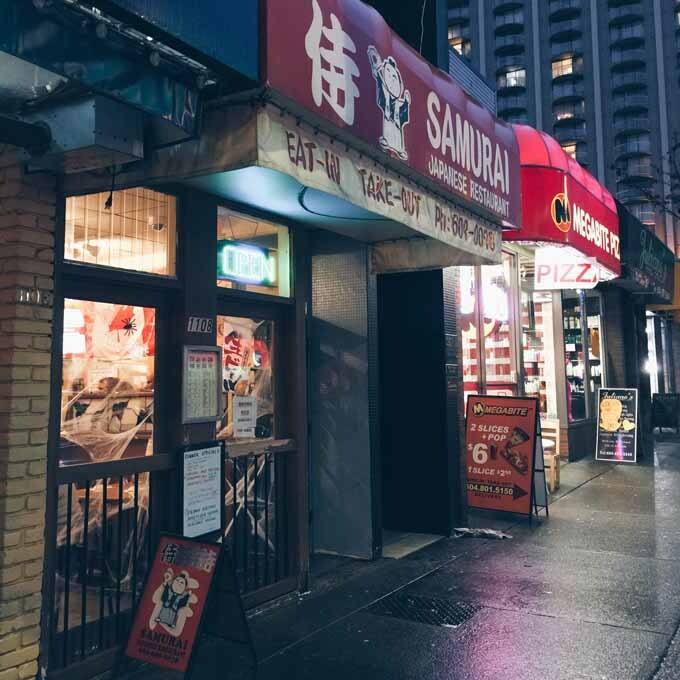 When I walk past Samurai Japanese Restaurant, however, I always notice that it is busy. There would be people coming out with takeout or a line up of people inside waiting for a table. It was only recently that I decided to give this sushi place a try. Below are my experiences from two visits. 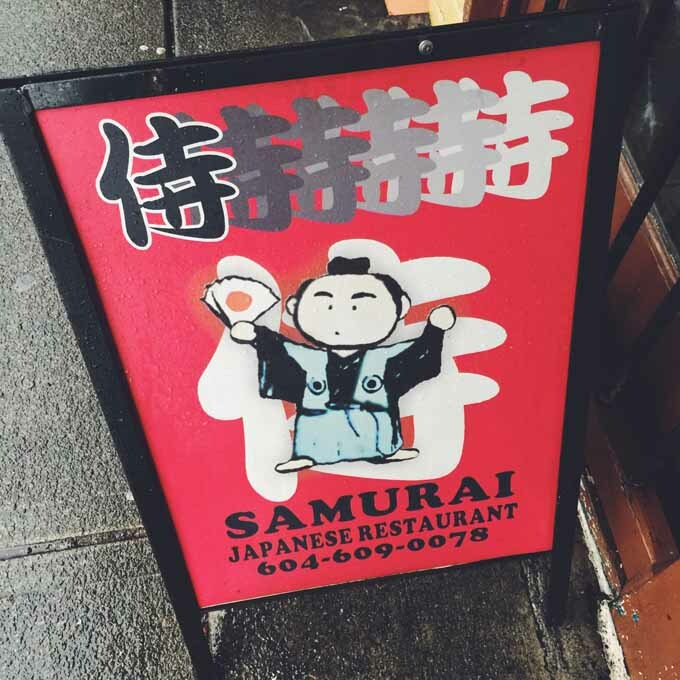 Samurai Japanese Restaurant is a small and casual eatery. The lighting is dim inside. You can also sit at the bar and watch the sushi chefs at work. On the first dine-in experience, I had the Victoria roll ($6.50). It had prawn tempura, yam tempura, and tempura chips. 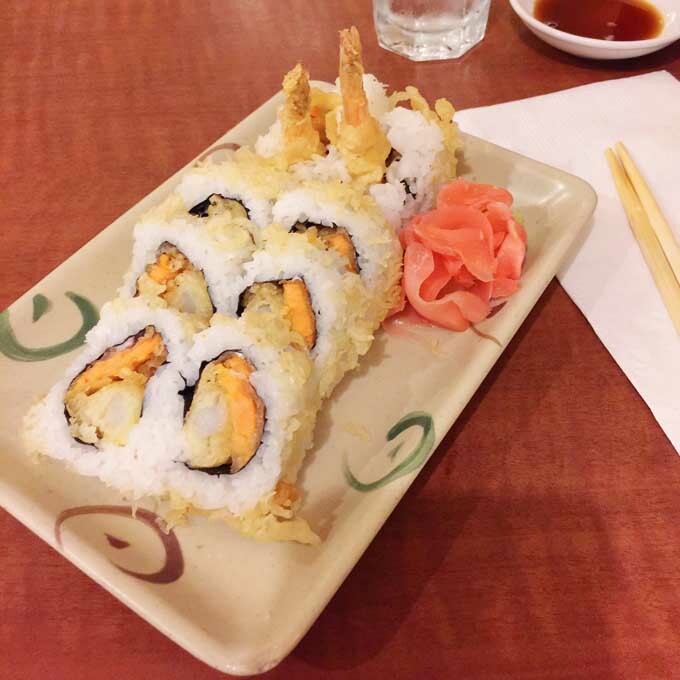 The tempura was nice and crunchy. 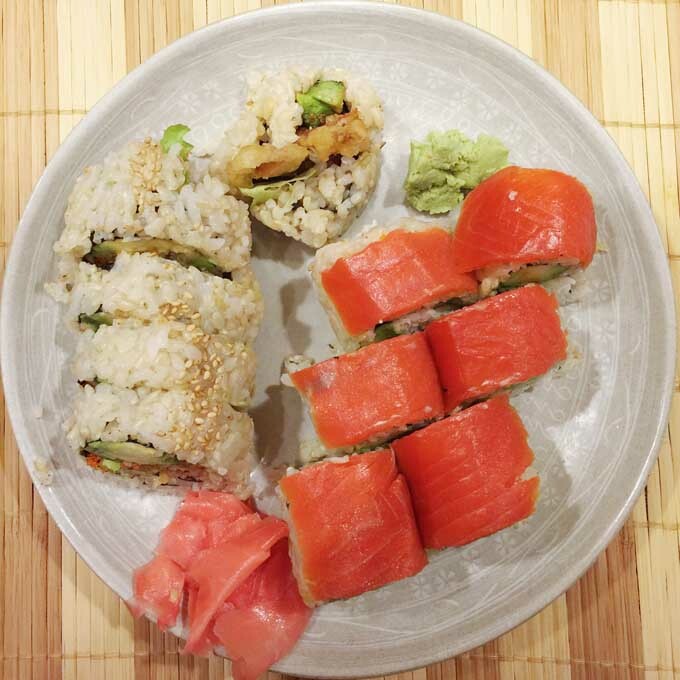 I also ordered the salmon avocado roll ($4.50). The avocado and salmon seemed fresh. On a different occasion, I tried the crunchy roll (left) and Vancouver roll (right). The crunchy roll ($4.50) had an interesting texture because it contained soft shell crab. 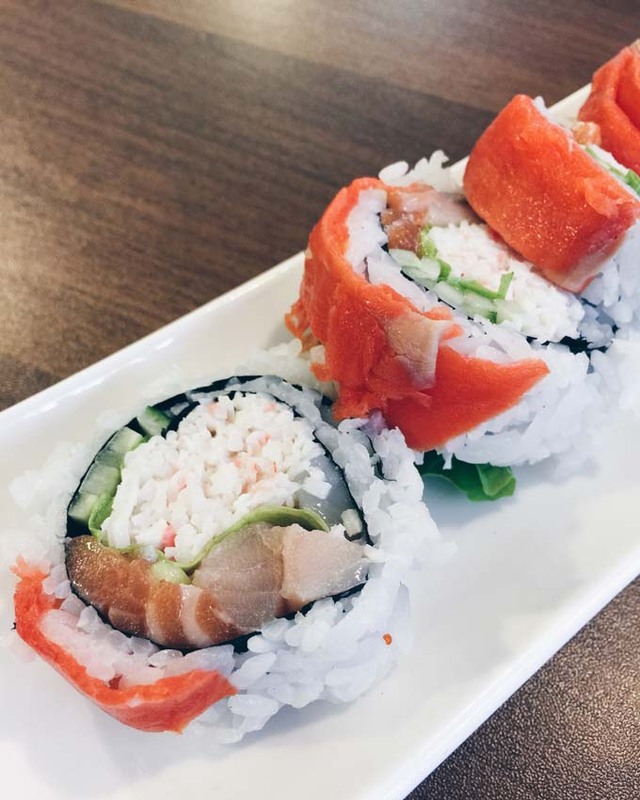 The Vancouver roll was California roll with smoked salmon on top ($4.90). It tasted pretty much what you would expect from its ingredients. 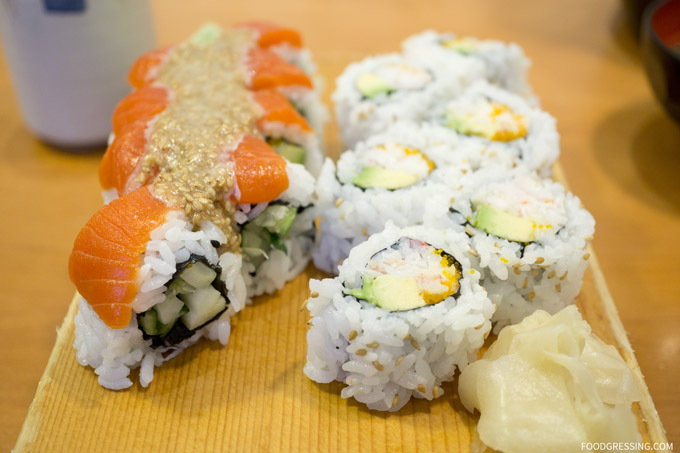 Samurai is known for their large portions of sushi. I had just a few pieces from my order and I was done. I had to take the rest home as takeout. In terms of the sushi quality, I would have to say that it is just *okay*. It was definitely not the best tasting, but still edible. The items are priced well for the portions. 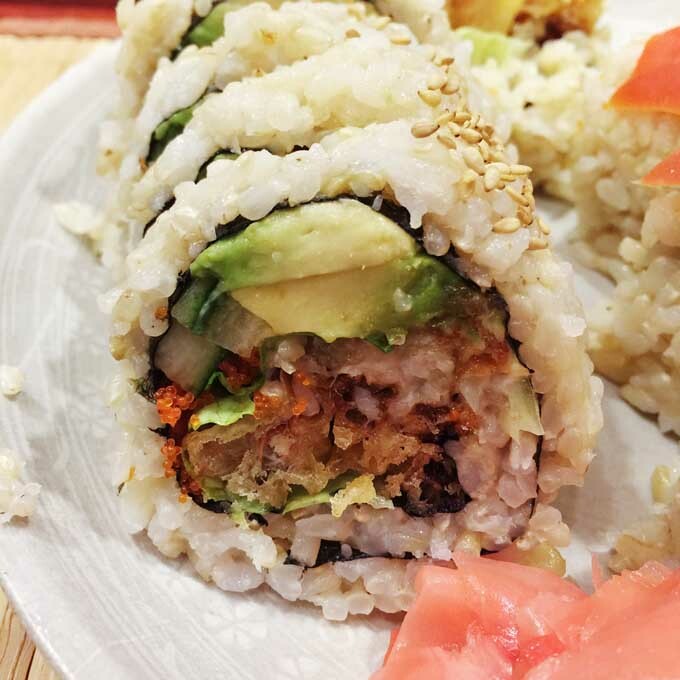 The sushi rolls had a good proportion of rice to other ingredients, so it was not all just about the rice. 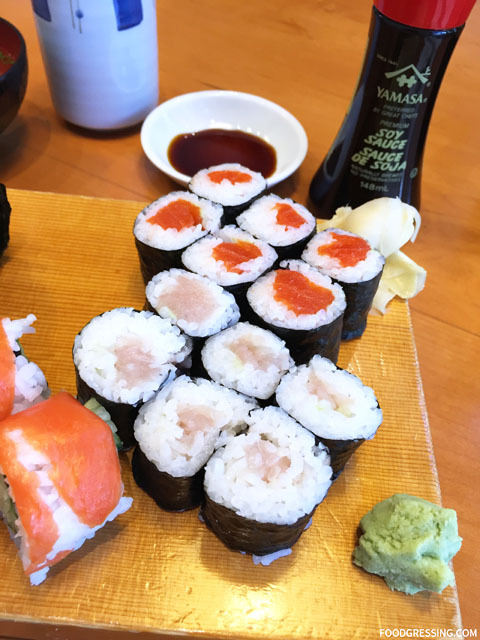 If you are looking for cheap and large-sized sushi and are not too picky in terms of quality, then you might want to try Samurai Japanese restaurant. 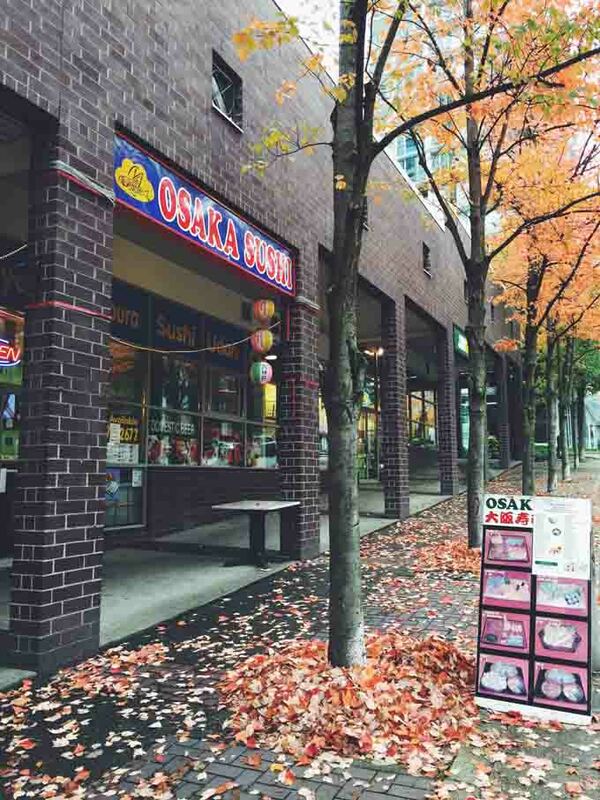 Osaka Japanese Restaurant is a casual diner located on Burrard and Pacific in Downtown Vancouver. 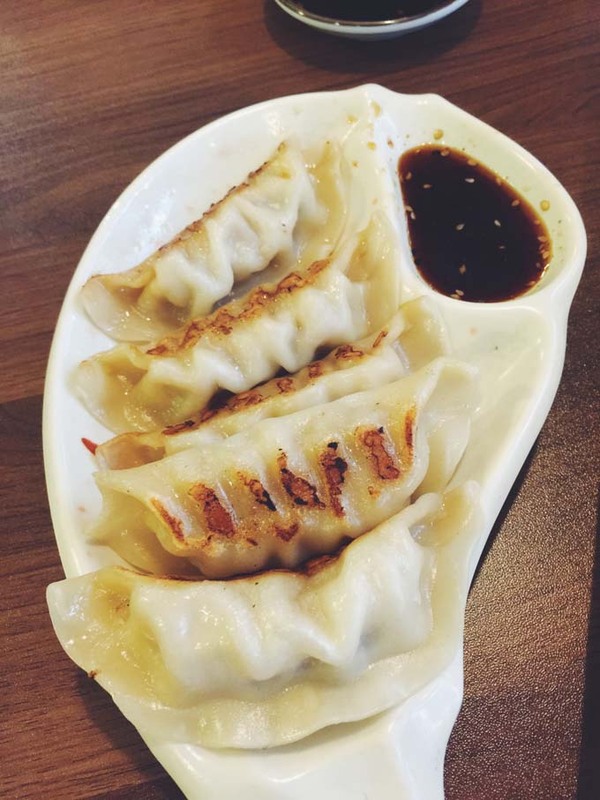 I came here for lunch with a colleague and we ordered just four items (three house special rolls and gyoza) but were quite filled afterwards. The restaurant space is clean and bright and we sat at a booth along the windows. If you’ve ever visited Osaka, then you’ll know the must-see Osaka attractions. It’s a great place and the food is incredible. 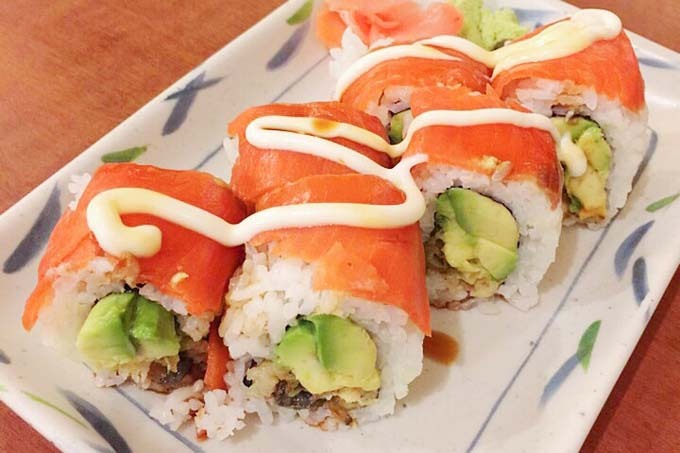 The Twin Salmon Roll had salmon, avocado, cucumber, cream cheese, and smoked salmon on top with tobiko. This dish was nice and light overall. The Hawaii Roll had avocado, cucumber, crab meat with mango. I love how the mango slices look like they are glistening. This was a beautifully presented dish with refreshing mango and was my favorite of the three house rolls. 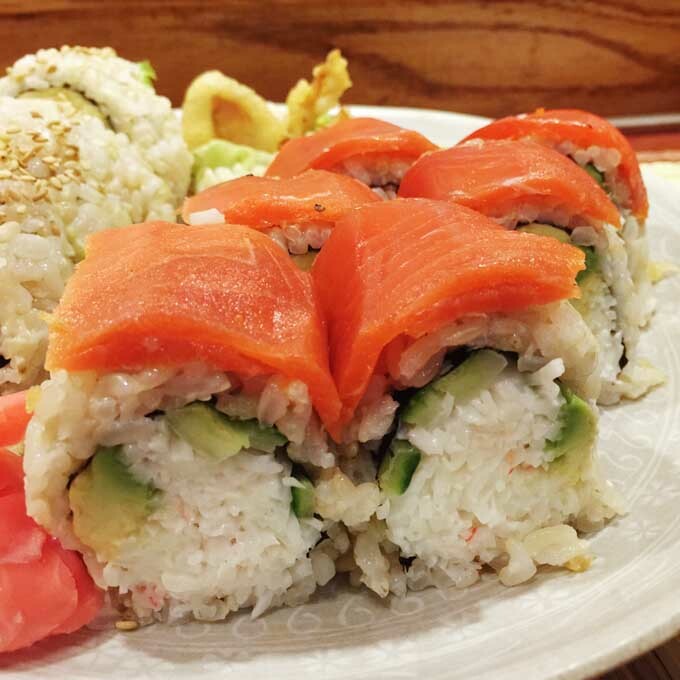 The Osaka House Roll had tuna, salmon, scallop, prawn, crab cake, cucumber, and lettuce with smoked salmon on top. I did not feel like these rolls had as much taste over and was my least favorite of the three house rolls we tried. The service was great as the waitress was very attentive towards our table and refilling our tea regularly. The price of the food was inexpensive in my opinion, with house special rolls ranging from $4.25 to $9.95. I hope to return to Osaka Sushi in the future to try out other items.